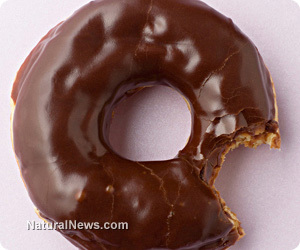 Study finds Western diet leads to advanced aging and premature death - Are you slowly killing yourself? (NaturalNews) Nutritional researchers have repeatedly demonstrated that what we eat directly determines genetic expression and can predict chronic disease risk, rate of aging, quality of life and mortality. A diet predominated by processed foods and laden with sugars, hydrogenated fats and refined carbohydrates has been shown to promote metabolic oxidation, systemic inflammation and lowered immune response that opens the door for heart disease, diabetes, dementia, stroke and many forms of cancer. A new research body evaluates precise risk factors in the development of several chronic illnesses and premature death. A research team studying the dietary habits of British adults has published the results of a study in The American Journal of Medicine that shows how following a Western-style diet consisting of fried and sweet foods, processed and red meats, refined grains, and high-fat dairy products can reduce a person's likelihood of achieving older age in good health and with higher functionality. Scientists assessed dietary habits in midlife, using dietary patterns and adherence to the industry standard Alternative Healthy Eating Index (AHEI). The lead study author, Dr. Tasnime Akbaraly noted "The impact of diet on specific age-related diseases has been studied extensively, but few investigations have adopted a more holistic approach to determine the association of diet with overall health at older ages." Past studies have shown that following the AHEI standards can double the odds of reversing metabolic syndrome, a condition known to be a strong predictor of heart disease and mortality, and can identify factors known to prevent premature death while promoting ideal aging. The research team followed 3,775 men and 1,575 women with an average age of 51 years between 1985 and 2009. After analyzing records from hospital visits and the results of screenings every five years, the team identified mortality and chronic diseases among participants. Over the course of the study, only 4 percent of the participants exhibited markers considered to represent ideal aging. Researchers determined that low adherence to the AHEI increased overall risk of cardiovascular and non-cardiovascular death. Following a Western-style diet consisting of fried and sweet foods, processed and red meats, refined grains, and high-fat dairy products significantly lowered chances for ideal aging. Dr. Akbaraly concluded "We showed that following specific dietary recommendations such as the one provided by the AHEI may be useful in reducing the risk of unhealthy aging, while avoidance of the 'Western-type foods' might actually improve the possibility of achieving older ages free of chronic diseases and remaining highly functional." Although not specifically mentioned, following a Mediterranean style diet provides AHEI compliance and has repeatedly been shown to lower risk of chronic disease and extend lifespan.